Nomia designer Yara Flinn is known for her stark, minimalist, no-frills clothing, but that doesn't mean her parties are cracker-and-water affairs. 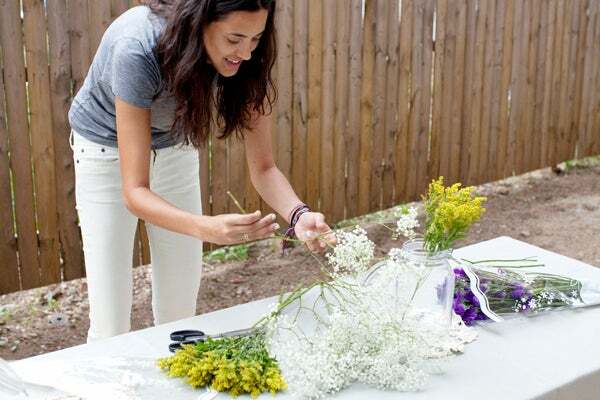 When she decided to convert her weed-infested backyard into an urban oasis, we urged her to throw a lil' get-together to commemorate the occasion. 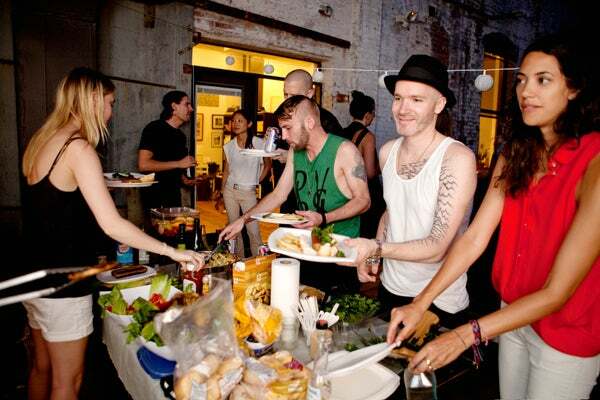 After sprucing up the space, employing some friends to help out with the prep, and ringing up all her friends to pop by, Yara had all the makings of a summer night to remember. 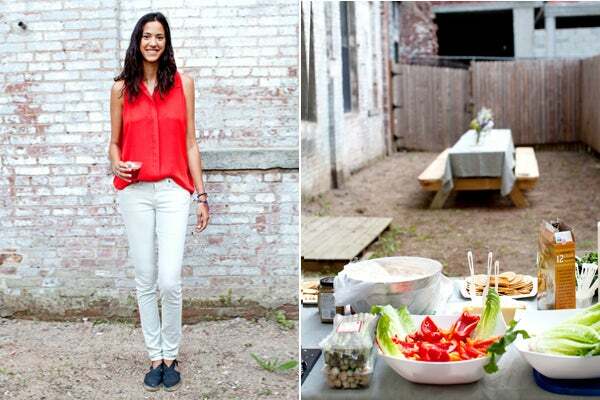 Click through to read about how she threw the whole thing together, the little snafus that kept things interesting, and how one wrangles enough sangria to appease the thirsty masses. 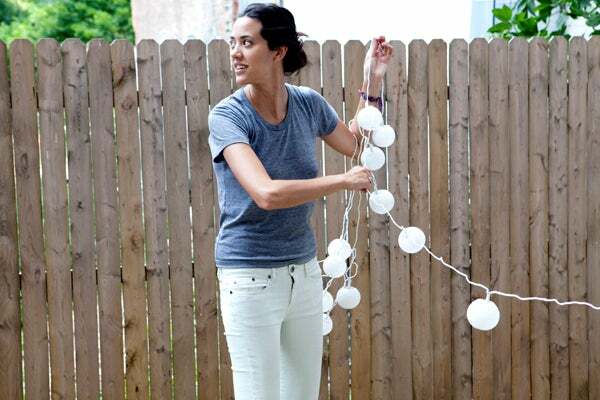 "Me stringing up the (unfortunately) non-functioning paper lanterns." First thing's first: the food! What led you to choose a buffet-style dinner rather than a course-by-course meal? "I like the informality of a buffet-style meal. 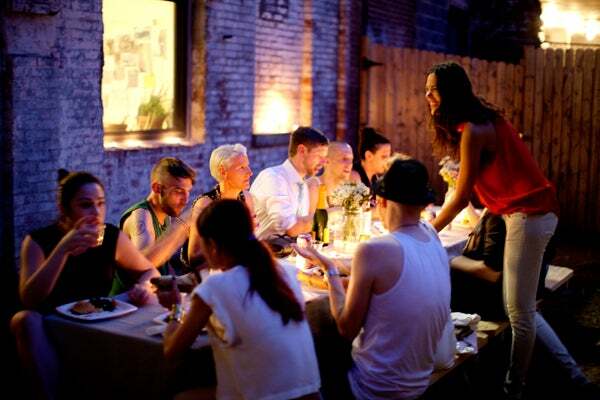 I wanted people to feel free to mingle, and I think seated dinners tend to discourage that." "Getting ready! 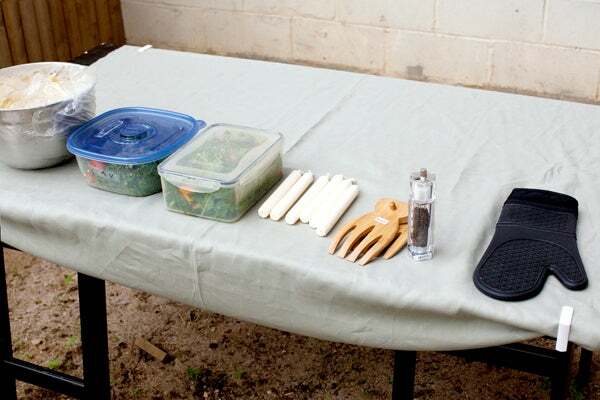 Kale salads and a BBQ mitt." Have you got any recipes that are surefire winners? "My family would laugh out loud at this, since I am not known my my cooking prowess ... However, for this occasion, I learned a recipe I surely be recreating: a kale salad with heirloom tomatoes and feta, and actually it went over really well!" What creative elements of your party were you the most proud of? "I was really into the gray, linen tablecloth with the wildflowers in mason jars. It was nice but still very natural feeling, which is pretty much the style philosophy I live by." 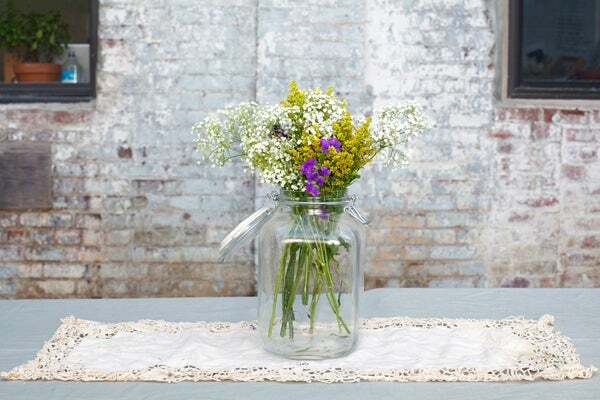 "Flowers, mason jar, vintage linens." In terms of decor, how'd you maintain the vibe? "I bought six yards of gray linen in the garment district, got some cute flowers at the supermarket and placed them in mason jars from home. I bought some vintage linens at Junk (in Williamsburg). The tea lights provided just enough lighting!" 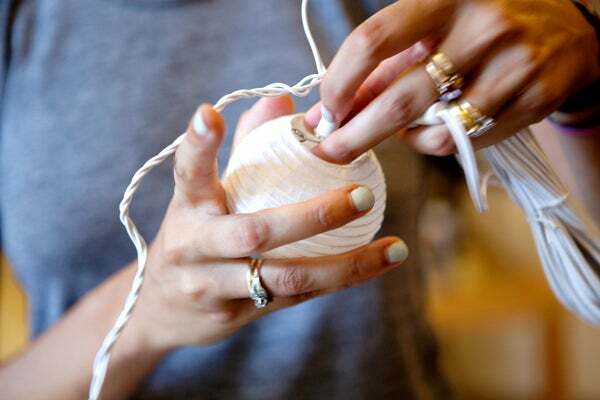 "Putting out all the tea lights with Akari, my friend and an amazing stylist!" 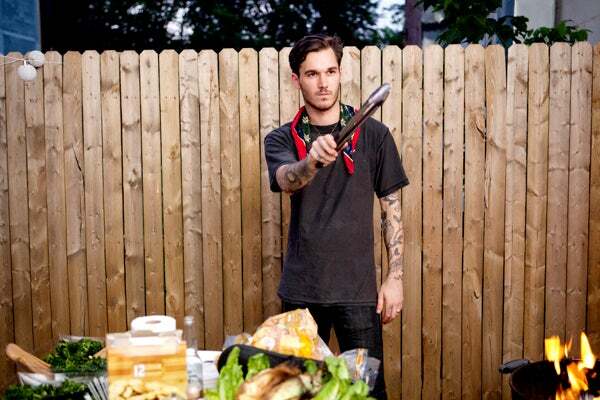 "My brother taking charge of the grill." 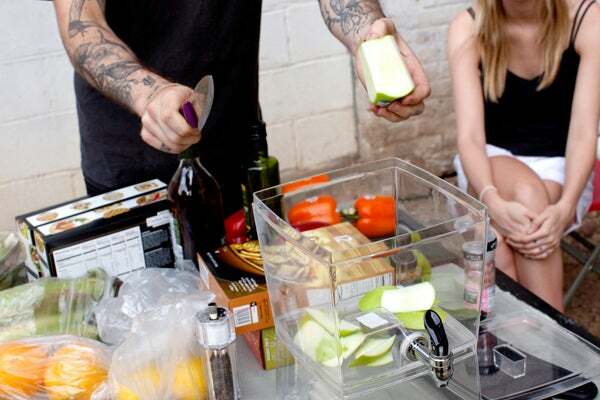 "Slicing apples for the sangria." "Four bottles in there! Just add oranges and green apples." We love that you made a big batch of booze for the party. What's your philosophy on cocktails at a dinner party? "Keep 'em coming! 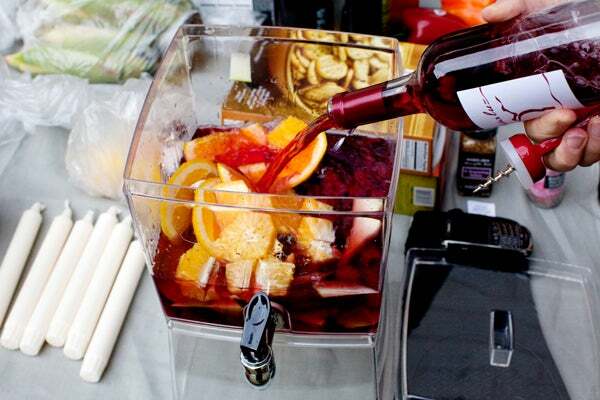 I found a simple recipe for a rose sangria, which felt summery and light. Then, we provided some extra bottles of wine and beer." Left: "Me posing and pretending not to be stressed"; Right: "Anxiously awaiting arrivals ..."
What's your go-to hostess outfit? 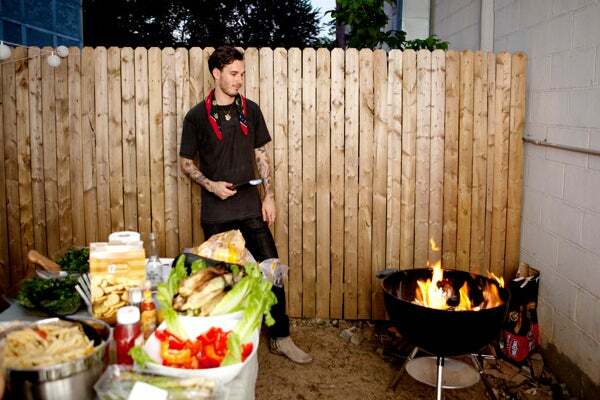 "You have to be easy and comfortable if you are hosting an outdoor BBQ. 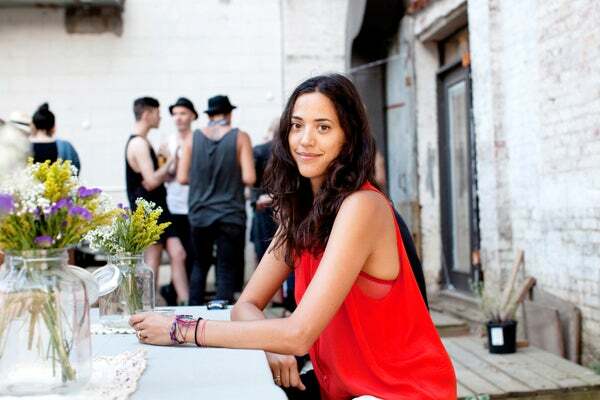 I wore one of my sleeveless, silk shirts in a bright red-orange and some light-colored jeans." "Adrian and Akari looking stylish and summery." 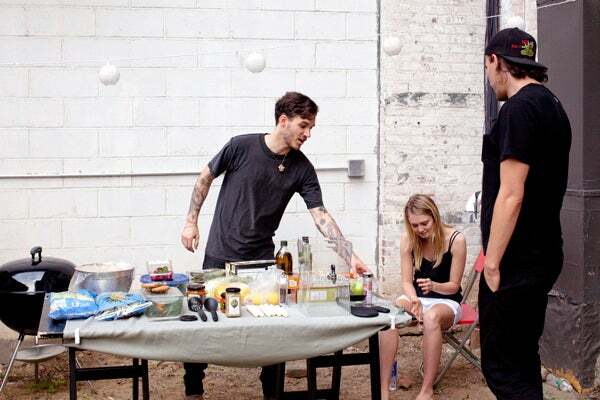 We see that you employed your friends to help you host (we love that!). Do you generally like to do everything yourself or delegate out the duties? "I am a very inexperienced party host, so all my friends and family were gracious enough to help me out. 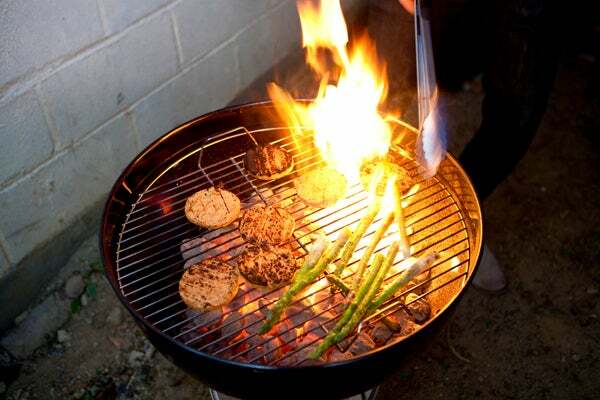 My boyfriend and parents ran out for last-minute shopping runs, and my brother was the grill-master. 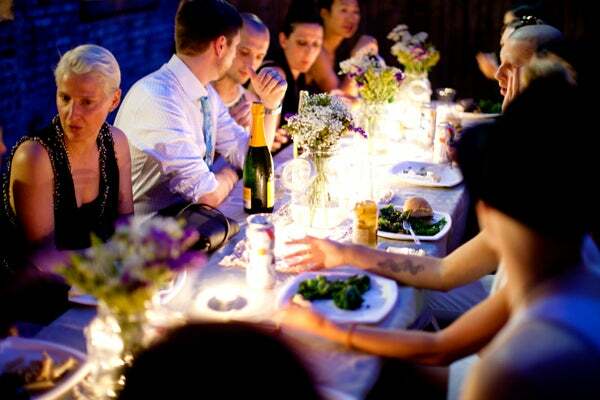 I think part of the fun of dinner parties is preparing things together (hopefully my guests feel the same?)." My friends wear a lot of black. What's the ideal guest-list mix? "My friends are amazing, so any party is easy and fun with them around." Did anything not go according to plan? How'd you roll with the punches? "Ha! Nothing ever goes according to plan, and I've learned that the hard way after putting on five fashion shows. You just try to remain calm, delegate, and hope you have amazing friends and family who are available to help out! Our paper lanterns didn't work, so we replaced them with tea lights, and the vibe was so intimate and cute. Happy accident, I suppose?" Did you play music? What jams did you sling? "I realized at some point there was no music playing ... (whoops!) so, I enlisted my friend Serena to iPod DJ, she did a great job. She played some Beach House, Atlas Sounds, and The Drums." What a beautiful backyard! Tell us the story behind the space! "It's pretty crazy because literally one week before, my yard was overrun with four-foot high weeds! (I'm a busy lady ...), so I have to give a huge thanks to my super for helping clear it out. I am now committed to keeping it up and even started planting some vegetables and flowers!"